The Badger Ordnance M5 DBM Long Action Standard Triggerguard is a heavy-duty guard similar to our M4 but allows quick loading/unloading via an AICS LA Standard pattern mag (not included). It utilizes a time proven paddle-style mag release for a reliable drop-free system. The M5 BDM includes Grade 5 TORX screws and bedding pillars to guarantee exact fit and perfect function. Machined from Aircraft Grade Aluminum and Mil Spec Anodized Hard Coat Type III finished. 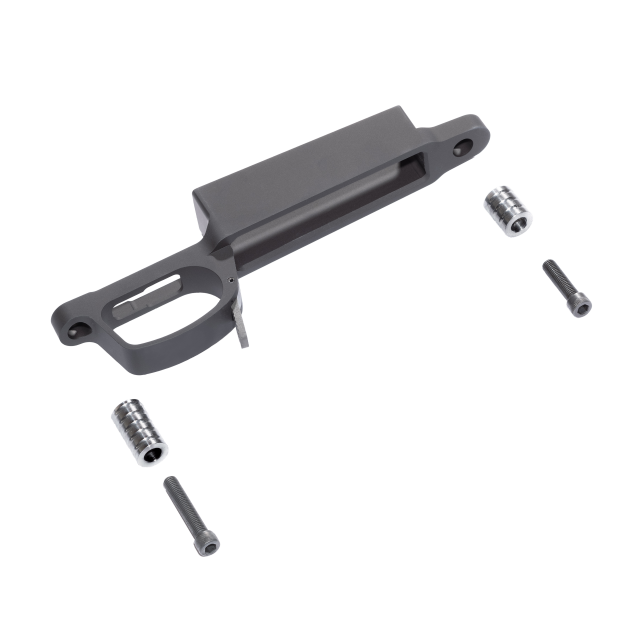 Compatible with cartridges built on a 0.470" case head such as .30-06 Springfield, .25-06 Remington, .270 Winchester, .280 Remington, 8mm-06, and others. For Remington 700 and Remington 700 pattern actions only. Inletting required.